Lately, Brooklyn has been bringing us down. Ok, ok, we know that is hyperbole, but it’s not far from the truth, the Brooklyn we knew and loved is gone. So rather than mope about it, let’s all remember together back when this borough was fun. 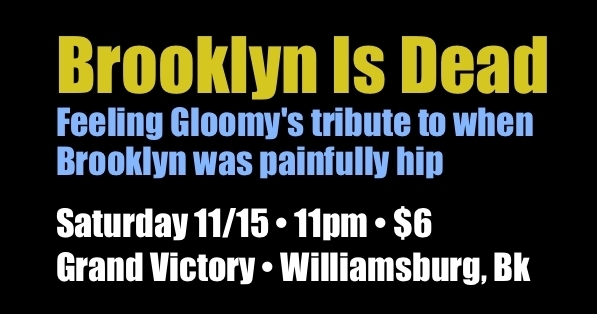 We’re throwing a funeral (and a dance party) to celebrate the Brooklyn we remember. Gordon and Nathaniel Gloom, ever your affable hosts, will fill the night with indie rock, dancepunk + electro from the last 15 years. Bands from Brooklyn, bands that played in Brooklyn, and songs we danced to in Brooklyn (we’ll post a Spotify mix in the comments to give you a better idea). So come help us remember Brooklyn when it was cool before this place turns into one giant Urban Outfitters. 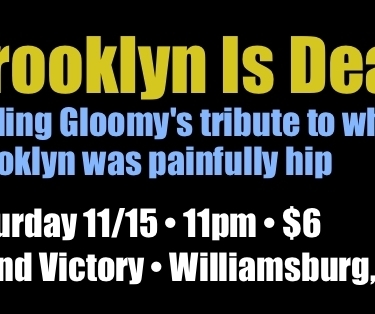 + We’ll eulogize the Brooklyn we all loved and cover Grand Victory (one of the last bastions of goodness left in the place) with tombstones and other funereal decorations.